MIDLAND PARK, N.J. - March 17, 2010 - With Spring arriving and the warm weather finally allowing area residents to get out of their houses and into their yards, Jacobsen Landscape Design and Construction is taking to the road, as its 2010 Landscape Design & Garden Educational Series is making a number of stops at of local libraries. Ranging from a basic "Principles of Landscape Design" seminar to a more advanced "Creating The Outdoor Room," the free seminars are led by Jacobsen?Landscape design experts and are open to all area residents. "We have been a part of the Bergen?County community for more than 30 years and our 2010 Educational?Series is our way of reaching out to our neighbors to share our passion for the environment,"?says Glenn?Jacobsen, LLP, owner and founder of design, construction and maintenance company with headquarters in Midland Park and a recently opened Landscape Gallery in?Saddle River. "We are committed to not only helping to make Bergen?County an even more beautiful place, but to protecting our environment while enhancing our enjoyment of the great outdoors," he adds. "It is part of the Jacobsen Landscape way of giving back to our community." The Educational?Series kicked off in early March with well-attended "Principles of Landscape Design" seminars at the Montvale Public Library on?March 4 and the Midland Park Public Library on?March 25. The schedule calls for upcoming visits to the Mahwah Public Library on Monday,?April 26, and the Washington?Township Public Library for two seminars on Tuesday,?May 11 and May 25. 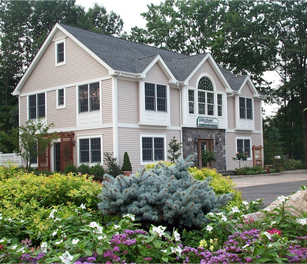 Through discussion and real-life examples, the Jacobsen Design Team covers such basics as where to start with a landscape plan, proper irrigation based on topography, patio design and material, retaining walls, regional plantings of the northeast, sprinkling systems, water management, newest and most efficient low voltage lighting options, proper lawn care and more. Attendees also learned about protecting the environment through Sustainable approaches to landscaping. A focused seminar on "Growing Herbs for Healthy Living" will be held on?Wednesday, May 5 at the Upper Saddle River Public Library and on Tuesday,?May 11 at the Franklin Lakes Public Library. This seminar was a part of the Franklin?Lakes Health?Fair in mid-March as well as at a special evening session at the Montvale Public Library on March 18. In this seminar, attendees learn how to select herbs, which types of soil to use and when, how much water is too much or not enough, the importance of light, garden design from the simplest to most formal, proper care and harvesting, preserving and more. The third seminar in the 2010 Educational?Series, "Creating the Outdoor Room," will be held on Thursday,?May 13 at the Upper Saddle River Public Library. At this informative seminar, the Jacobsen Design Team will explain how homeowners can consider an outdoor room as similar to an indoor room, but with walls formed by trees, hedges or fences. Flooring can be grass, pebbles, stepping stones or as elaborate as a multilevel deck or slate tiles and ceilings may be outlined by tree limbs, pergolas, awnings or permanent roof. Unique lighting creates ambiance while increasing functionality.